The most effective vehicles for nostalgia are often sensory: the sight of former stomping grounds revisited after time away; the unbearably saccharine wave of the vodka coolers you swore off after too many notoriously bad youthful hangovers; the whiff of a perfume worn by a former lover; or – arguably most potent – the melody of a song you’re surprised to find you still know every word to despite years of forgetting it even existed. All of these serve to remind us of our own stories, suddenly and unexpectedly transporting us back to a long-lost moment without the need for extrapolation. A nostalgic rhythm of this kind runs through Greg Rhyno’s debut novel, To Me You Seem Giant. The story follows Pete, a teacher from Thunder Bay, Ontario, during the first semester working at his hometown high school after abandoning an attempt at a music career in Toronto. The story’s chapters are alternately narrated by pseudo-adult, 27-year-old Pete, and a teenaged version of the character, in his last year at the same high school, to whom music is not only the axis of his social world, but his very lifeblood. Though they represent very different life stages, both iterations of the character share the same struggles in their pursuit of self-acceptance, and both exist in a perpetual state of anxiety about whether they’re making the right choices and what they might be missing out on. Much of Pete’s angst hinges on Soda, his ex–best friend (and high school bandmate), who ditched Thunder Bay – leaving behind Pete and the band’s bassist, Deacon – to tour with a rival band and, eventually, fulfill the dream of becoming a legitimate rockstar. Pete and Soda’s long-anticipated reunion proves disappointing, revealing the latter to be as self-serving and withholding as ever – the epitome of the tortured (yet conceited) touring musician. A brooding tenor – combined with a lifelong love for music that manifests itself in new ways as he ages – lends Pete’s character a believable continuity. This is abetted by chapter transitions that cleverly link past and present events. Pete still has a lot of growing up to do, as can be seen in the adult sections of the novel, especially with regard to his attitude toward the women in his life (something that at times can be a cause of frustration for a female reader), but he has nevertheless come a long way. His return to Thunder Bay as a professional man, however, reveals the difficulties associated with completely jettisoning the burdens of adolescence. 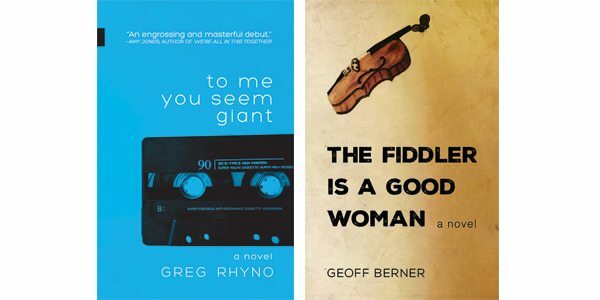 An elusive rockstar also serves as the driving force behind musician Geoff Berner’s sophomore novel, The Fiddler Is a Good Woman. Though the titular fiddler, DD, only appears via others’ recollections, her presence is as perceptible and unwavering as a drum beat. Each of the various characters who narrate the book divulge their most significant memories of her to a fictional version of the author, who’s tasked with chronicling DD’s story after she mysteriously disappears. The often conflicting accounts of the eclectic, ethereal, gap-toothed fiddler portray her as someone with whom everyone maintained a love-hate relationship. Despite (or maybe because of) this, all the characters privately seem to wish they could be her: she comes across as shockingly confident without seeming arrogant; transient but always at home wherever she finds herself; continually involved with one or more lovers, but never cruel in her assignations; able to light up any conversation, but troubled enough to find vast wells of inspiration for her art. Though she remains technically absent from the story and never gets to speak for herself, by the end we feel as if we know her more intimately than we’d perhaps like to. The book’s non-traditional structure, though admittedly trying at times, proves eccentric and imaginative, blurring the lines between novel, memoir, biography, and transcription. It also serves to supply some colourful background about a niche Canadian music scene, and helps keep us guessing about the true nature of the elusive title character. These two novels are homages, told in very different styles, but it’s evident that both authors share a passion for music and its potential to define a period in someone’s life, or a life entirely.